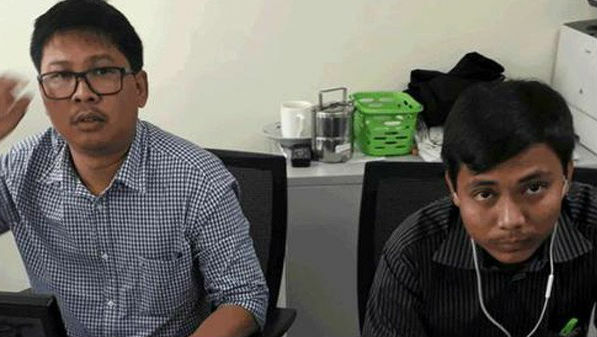 Washington [USA], April 16: Jailed Reuters journalists Wa Lone and Kyaw Soe Oo won a Pulitzer Prize for international reporting for uncovering Rohingya killings in Myanmar's Rakhine state, on Monday. The two reporters were imprisoned by authorities in Myanmar, on charges of breaking the country's Official Secrets Act, while they were conducting investigations into the killings. They have been handed a total sentence of seven years in jail - a move that has been slammed by human rights and press freedom groups all around the world. Bangladesh Proposes Creation of Safe Zone for Rohingyas In Myanmar's Rakhine. They have spent 490 days in jail already, as Reuters continues pushing for their release. "I'm thrilled that Wa Lone and Kyaw Soe Oo and their colleagues have been recognised for their extraordinary, courageous coverage...I remain deeply distressed, however, that our brave reporters Wa Lone and Kyaw Soe Oo are still behind bars," Reuters Editor-in-Chief Stephen J. Adler said. The investigative report revealed the killing of 10 Rohingya at Rakhine state's Inn Din village. The two reporters were moved into action after stumbling upon a mass grave filled "with bones sticking out of the ground," according to Reuters. Their investigations led them to obtain three pictures from villagers, out of which two showed the 10 Rohingya men bound and kneeling. The third picture portrayed the bullet-ridden bodies of the very same 10 men in the same grave. Before they could finish their report, however, they were arrested by the authorities in 2017. Named "Massacre in Myanmar," the report was completed by Wa and Kyaw's colleagues, Simon Lewis and Antoni Slodkowski, and published in February last year.